Introduction: The increased level of ethylene inhibits root elongation and causes physiological damage, thereby reduces ethylene level imparts a positive support against various biotic and abiotic stresses viz. phytopathogens, extreme temperatures, hyper salinity, flooding, drought, metal/organic contaminants and insect predation. The metabolic pathways showed the involvement of ACC synthase inhibition for ethylene suppression in plants. Objective: The primary objective of this study focused towards the use of In-silico approach to assess the inhibitory effect of S-adenosyl methionine (SAM) analogue on ACC synthase activity. Methods: The 3D structure of ACC synthase of Pisum sativum was constructed using modeler 9v11 software. The reliability of developed model was evaluated by PROCHECK, ERRAT and ProSA web servers. Furthermore the molecular interactions between substrate SAM and inhibitors were performed. Results: The docking study demonstrated that the binding energy of the substrate SAM is -5.37 Kcal/mol. The SAM analogue (Inhibitors) considered in this study were 3-dzSAHC, SAHC, sinefungin, SIBA, 7-dz-SIBA, 1-dz-SIBA,3-dz-SIBA and S-n-Butyladenosine. Among these analogues, 7-dz-SIBA was found to be most effective on ACC synthase as inhibitor due to lowest binding energy (- 5.51Kcal/mol) and strong Ki value (91.74 M). The LYS276 amino acid residue of ACC synthase was observed in the interaction with both substrates SAM and 7-dz-SIBA (S-isobutyl-7-deazaadenosine) demonstrates as most crucial catalytic residue for molecular interaction. Conclusion: This study successfully screened most potent inhibitor for ACC synthase which have indicated the compounds 7-dz- SIBA as effective inhibitor with lowest binding energy, better hydrogen bond interaction and strong inhibition constant compared to others compounds studied. Thus 7-dz-SIBA can be projected to use as a growth enhancer for overall crop improvement. It may help in plant growth promotion, prevents the plants from various environmental stress and phytopathogenic infections etc. Keywords: 7-dz-SIBA, ACC synthase, ethylene, molecular modeling, plant growth regulation, S-adenosyl methionine. Keywords:7-dz-SIBA, ACC synthase, ethylene, molecular modeling, plant growth regulation, S-adenosyl methionine. Abstract:Introduction: The increased level of ethylene inhibits root elongation and causes physiological damage, thereby reduces ethylene level imparts a positive support against various biotic and abiotic stresses viz. phytopathogens, extreme temperatures, hyper salinity, flooding, drought, metal/organic contaminants and insect predation. 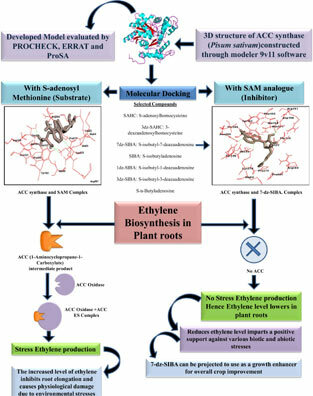 The metabolic pathways showed the involvement of ACC synthase inhibition for ethylene suppression in plants.